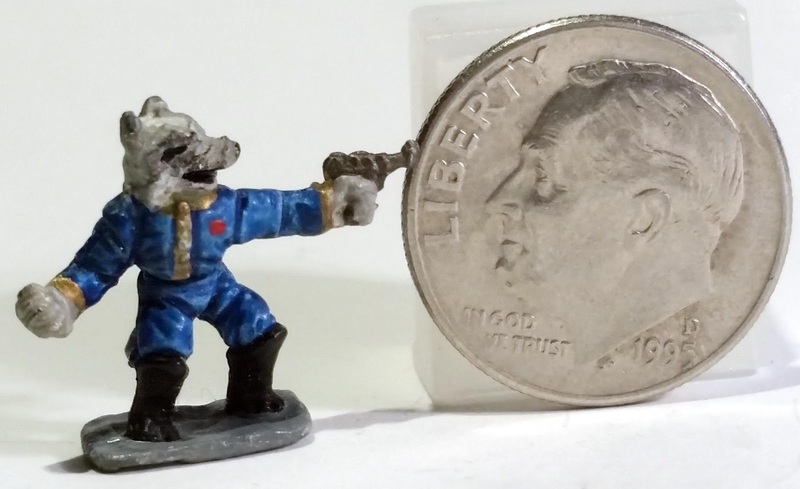 Although I love using miniatures in gaming, I was never much for actually painting them. Fortunately, a couple of my gaming friends were big into painting and I was always able to borrow one of their 25mm figures. When a couple game nights were planned just for painting and hanging out, I bought several packs of 15mm miniatures. 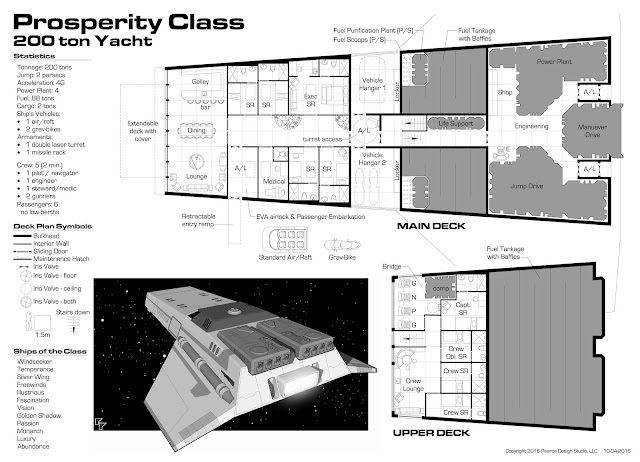 They were less expensive and were easier to use with the deck plans that came with Snapshot. I was surprised how few 15mm Traveller miniature images I found online, so I decided to photograph mine and post them. I kind of regret not taking the time to finish them. I've never photographed minis before and now I really regret painting most of my Zhos black and dark blue. I'm planning on printing out some of my full sized deck plans soon, so some of these minis might get some use for the first time in thirty years. This post was updated 11-20-2016 after discovering this Martian Metals catalogue. I've got a sketchbook filled with deck plan sketches, mostly small stuff - 100 to 200 tons, merchant ships, scouts and couriers, a few small military ships. As time allows, I'd like to clean them up and post them here. Using a custom 100-ton hull, the Hammer Class Merchant is a commercial vessel used for small cargo shipping and trading purposes. It mounts jump drive-A, maneuver drive-A, and power plant-A, giving a performance of jump-2 and 2G acceleration. Fuel tankage for 40 tons supports the power plant and one jump-2. Adjacent to the bridge is a computer Model 1bis. There are three staterooms and no low berths. 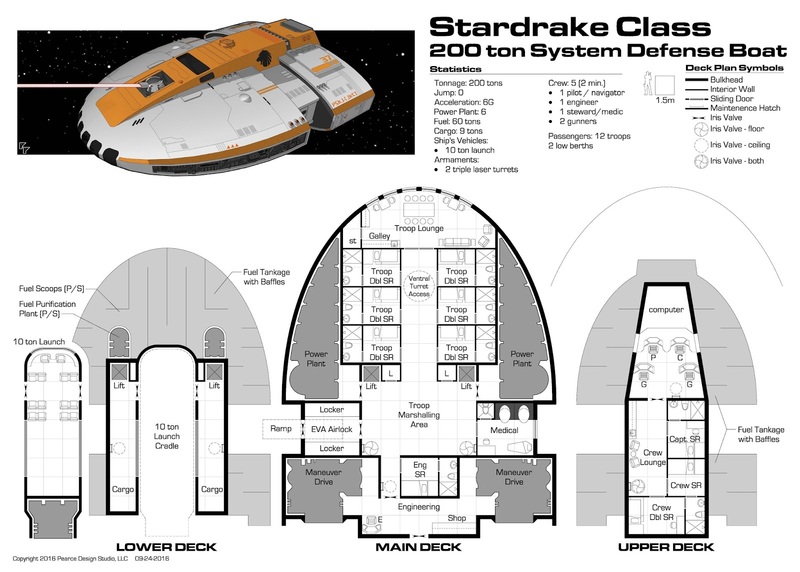 The ship has one hardpoint and one ton allocated to fire control. Installed on the hardpoint is a pop-out double turret, which mounts two beam lasers. There is one ship's vehicle: an enclosed 4 man air/raft. Cargo capacity is 15 tons. The ship is streamlined. The merchant ship requires a crew of three: pilot/navigator, engineer, medic/gunner. With it's relatively large cargo bay adjacent to the main airlock, the Hammer Class is easily converted to other uses. Popular conversions include the Hammer-Hunter variant used by bounty hunters and the Ore Hammer variant used by belters. 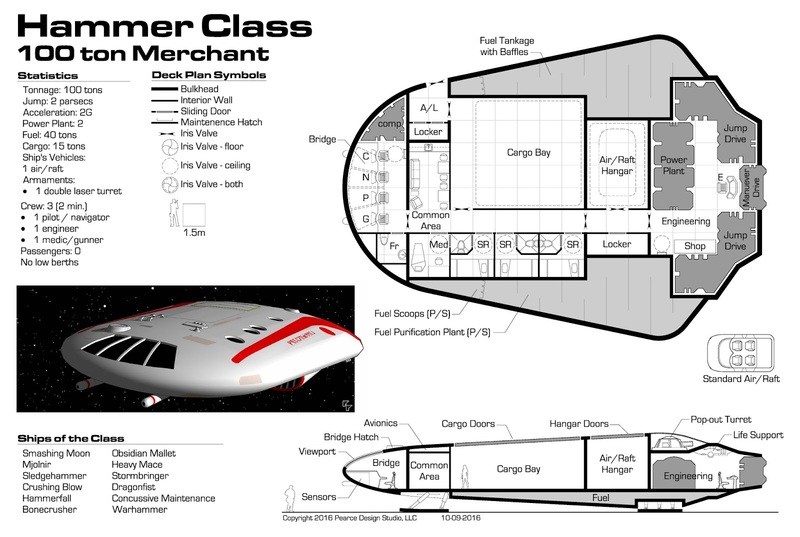 For a higher resolution PDF, click this link: (Traveller Starship Deckplan Hammer Class Merchant). The deckplan was created to be printed out on 24"x36". Scale is 1" = 5'-0" so it can be used with 25mm miniatures. Enjoy! It was a weird coincidence that the night before I started the A-Z Blog Challenge I came across Jake Parker's video on YouTube. He had just posted it that day. "Finished Not Perfect" became a sort of mantra to me over the last month. My initial idea of spending 1 to 3 hours a day was pretty much blown out of the water from the start. Some items posted were already created so they didn't take much time. Other items I had to research extensively before I even started working on them. 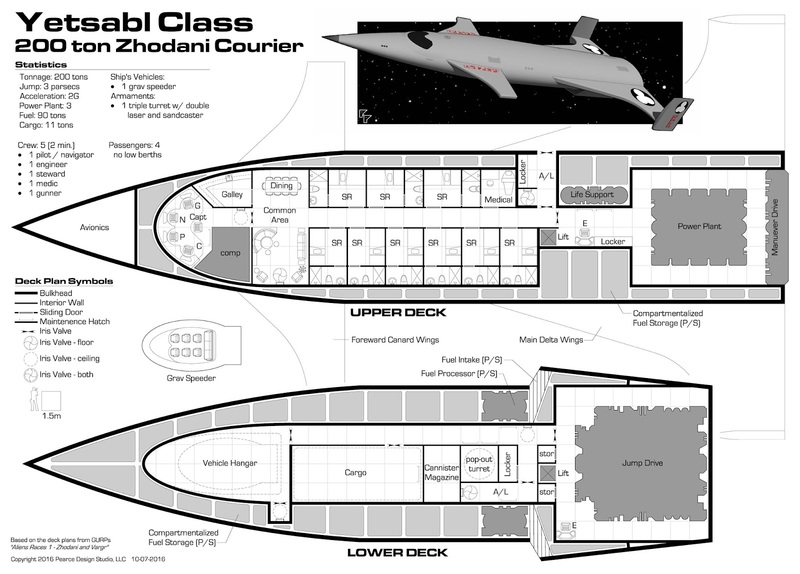 Some of the ships with 3D model and deck plans have 15 to 20 hours in them. I think I can safely say I've worked past my initial frustration of only creating one post in August. Lots of new ideas were generated along the way. This isn't the end, but I'll be taking a more realistic pace after this. So here's last entry for the A-Z challenge - my take on the Zhodani Courier. For reference I looked at both the classic Traveller Alien Module 4 - Zhodani and GURPs' deck plans from their Aliens Races 1 - Zhodani and Vargr. 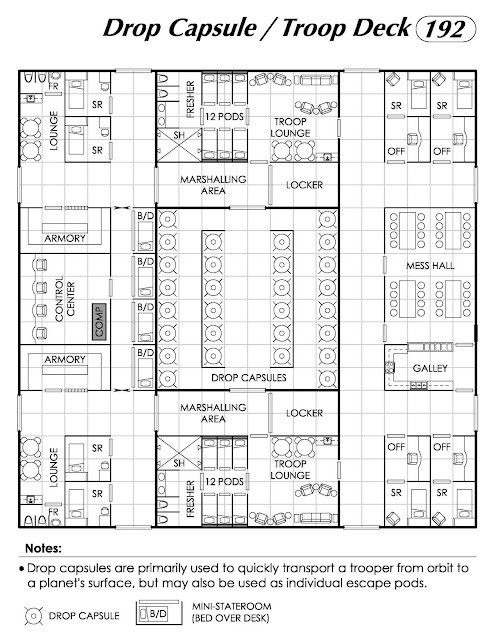 I don't understand why the GURPs deck plan shows the maneuver drives so big or why there isn't a power plant or computer called out. The engineering areas are completely reworked and I modified several other parts of the GURPs deck plan to make it more to my liking and to get it to conform with the CT book 2 rules. I also replaced the GURPs #$@&%*! hex grid with a proper square grid as nature intended. For a higher resolution PDF, click this link: (Traveller Starship Deckplan Zhodani Courier). The deckplan was created to be printed out on 30"x42". Scale is 1" = 5'-0" so it can be used with 25mm miniatures. Enjoy! 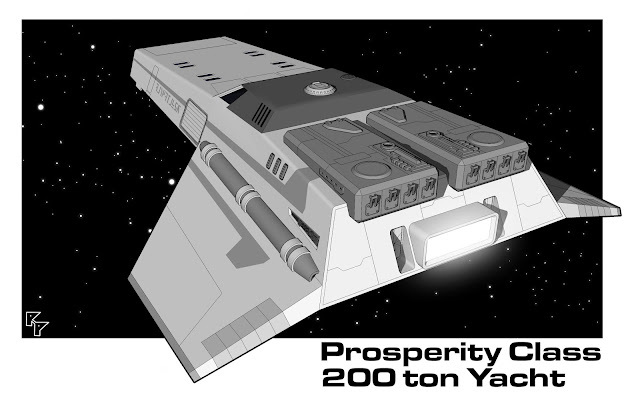 Here's my second take on a yacht for Traveller: the Prosperity Class 200 ton Yacht. Although the Destiny Class Yacht was fairly well received, there was much I didn't like. 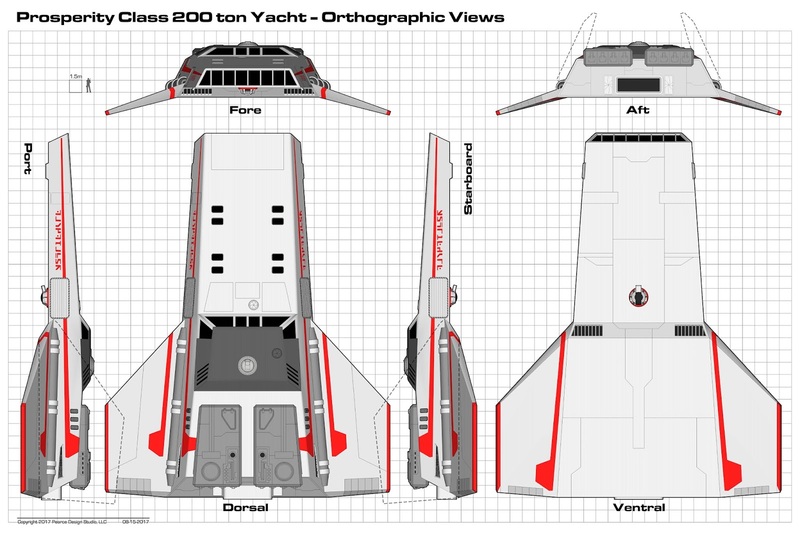 Statistically this ship is fairly similar to the Destiny - 200 tons, Jump 2, and 4 G acceleration. There is a much clearer delineation between crew and passenger spaces. No crew member except the steward and maybe the captain need to mingle with the passengers. The passenger lounge is roomy and takes advantage of the views from the bow of the ship. When landed, two transparisteel panels at the front of the ship can be opened up to an extendable outside covered deck to create an even larger socializing space. The dorsal turret is now a low profile missile rack - purely an aesthetic decision - and contains twelve small but high-yield missiles. The ventral turret contains a double beam laser. The ship uses large wings to assist in atmospheric flight and they fold up during landing to minimize the ship's footprint. The rear half of the ship rests on the ground during landings and the front is supported by landing gear. Thanks to everyone at Citizens of the Imperium for their input on the previous design. I'm hoping this ship is more worthy of the nobles and megacorp executives in your game. For a higher resolution PDF, click this link: (Traveller Starship Prosperity Class Yacht Deck Plan). The deckplan was created to be printed out on 30"x42". Scale is 1" = 5'-0" so it can be used with 25mm miniatures. Enjoy! At each system served by the xboat network, an express boat station is maintained to handle the message traffic and to manage incoming and outgoing xboats. 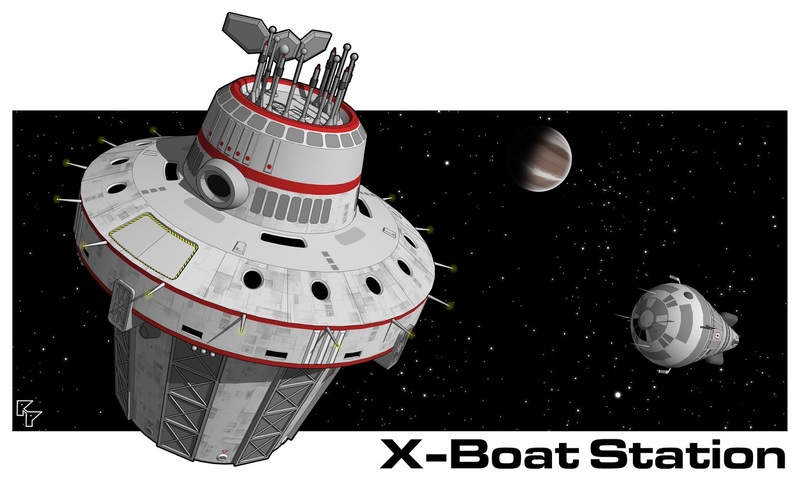 Usually located near the edge of a star system, the station picks up messages beamed to it by incoming xboats and relays the data to the local world for delivery. Messages destined for worlds farther down the line are transmitted to a waiting xboat which then jumps for the next world in the network. The xboat station contains receiving and retransmission equipment; refueling and support facilities for the local staff and waiting crew are also provided. The xboat station maintains a local office on the system's major world for the acceptance of xboat messages, as well as to handle delivery of the messages to addresses on the world. This 400 ton station was designed to support four xboats simultaneously, although most systems will not require this level of accommodation. 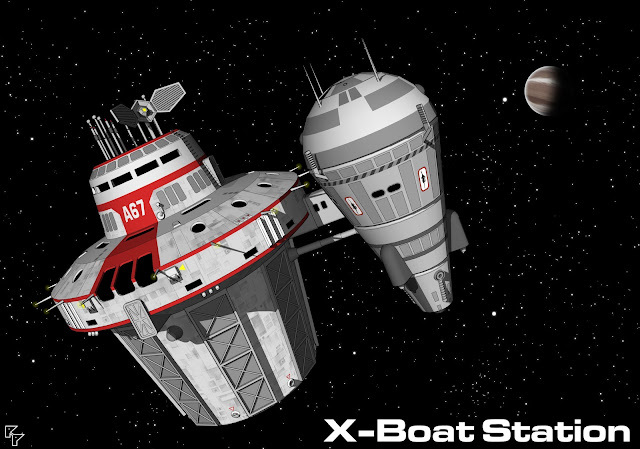 The bridge handles standard ship functions as well as the transfer of data from xboat to the main system. The top of the station contains a wide variety of communication and transmission equipment. There are two habitation decks, one for the station crew and administration, the other for xboat crews. 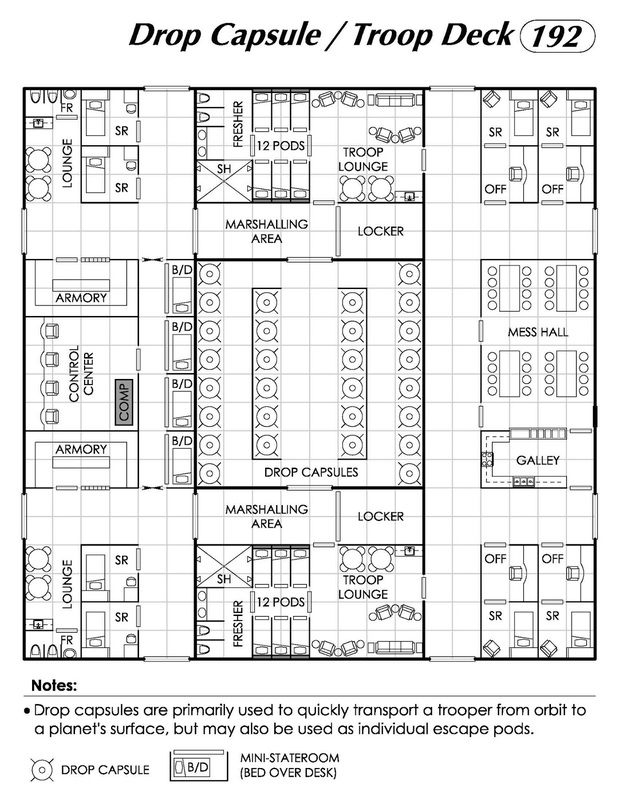 Staterooms and other accessory rooms encircle a large, open communal space housing the main galley, dining, and recreation space. The standard station contains a flexible space which can be reconfigured based on the demands of the local system. It may be used for cargo, training, gunners stations, or miscellaneous storage. The lower half of the station contains a large fuel tank with capacity to run the station and refuel four xboats. A 50 ton modular cutter outfitted for fuel storage makes fuel runs to the local gas giant where available. The station shown is unarmed, but has two hardpoints for future turrets, should they be deemed necessary. Prior to this edit the X-boat station was incorrectly shown as 200 tons, when it is in fact 400 tons. The image here and the PDF in the link have been updated. 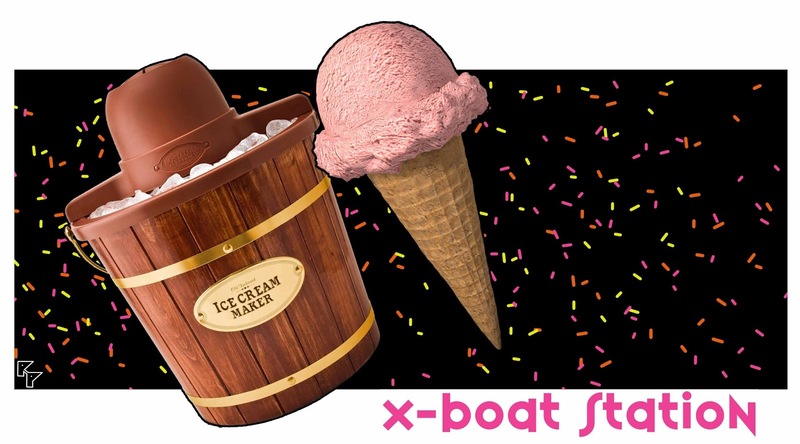 The xboat model is a slightly modified version of the one created by Cyberia23 at the SketchUp warehouse. 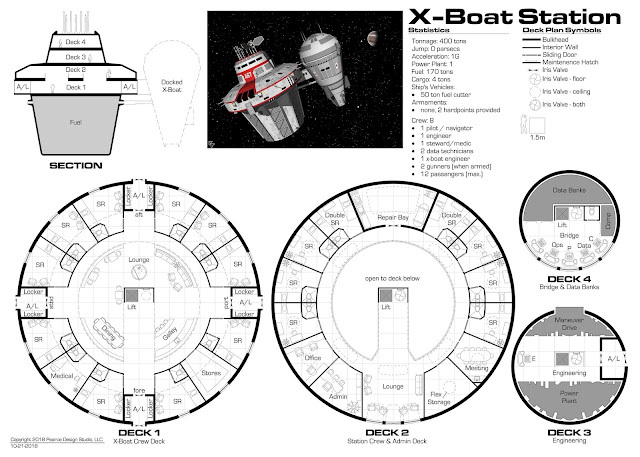 For a higher resolution PDF, click this link: (Traveller X-Boat Station Deck Plan). The deckplan was created to be printed out on 30"x42". Scale is 1" = 5'-0" so it can be used with 25mm miniatures. Enjoy! Similar in size and form to the Zhodani Tliazhashal PP04 medium warbot, the Harkuna model S3S by Ikeda Robotics is designed to be quickly reconfigured in the field to serve a wide variety of mission roles. The standard combat package includes two heavy energy weapons, usually heavy lasers, PGMP-13s or FGMP-14s. The base model includes a basic sensor package but can be upgraded with just about anything desired. For reconnaissance missions, the heavy weapons can be swapped out for a recon mission package which includes densitometers, neural activity sensors, PRIS optics, and other miscellaneous sensors. Two retractable light arms are located in a 360 degree swivel mount in the lower torso and are capable of handling any standard human tools or weapons. Between combat operations, the heavy weapons can be replaced with heavy work arms to facilitate field base construction and supply relocation. For spacecraft operations, the S3S is designed to be able to go just about anywhere a soldier in battledress can go. Standard doors, airlocks, vertical hatches, and elevators are all accessible to the warbot. At TL 15, and with the proper resources, this robot can switch out its own hardware and software to meet just about any mission requirement. Most worlds view a warbot much like any other weapon, and as such they are restricted by local law level. Warbots used as personal body guards are not unheard of, but such use is rare. Actions taken by a warbot are the responsibility of the owner. 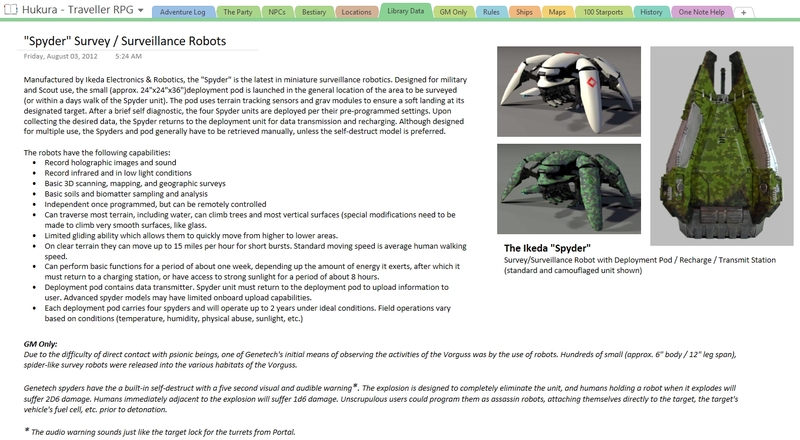 Stripped of it's weapons and associated programming, the standard warbot can be reconfigured for a wide variety of non-military uses. The Adventures of JON-E Warbot, was a wildly popular children's animated tri-vid series produced in the early 1090's. The show followed the exploits of a stern voiced and duty bound E-series combat robot and his skilled, but trouble prone robot technician, Clark "Skippy" Weston. Being a children's show, there was never any overt violence against humans. Many of the adventures focused on rescue and humanitarian missions. When combat operations were presented they either featured stun weapons or were against enemy robots. JON-E's famous catchphrase of "Kerpow, kerpow!" spread to all corners of the Spinward Marches. 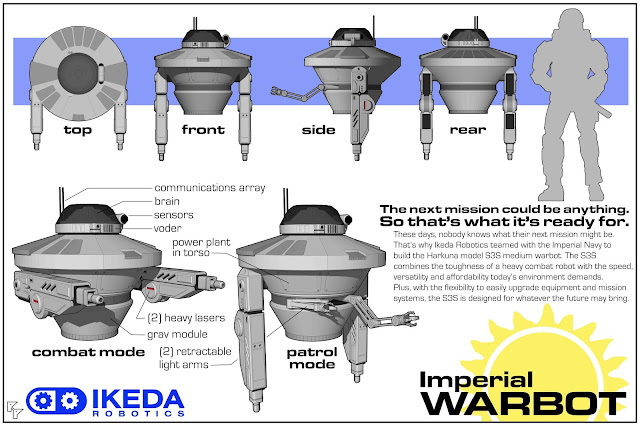 Funded by Ikeda Robotics, the show's critics labeled it as pure propaganda and a recruitment tool for the Imperial Navy. The show's antagonists were thinly veiled Zhodani, but never called such. There is speculation that the show stirred anti-Zhodani sentiments and glorified war, at least in the eyes of impressionable children, and possibly helped to expedite the start of the Fifth Frontier War. Fan favorite episodes include "Skippy and the Brain Pirates", "The Return of Dr. Dredzliar", and the heart-breaking "Flowers for Sargeant Goodfellow". "I was always very proud of that show", said Galt Trydine, retired public relations executive for Ikeda Robotics. "We had actually produced a combat model very similar to JON-E, and it's capabilities were pretty faithfully represented in the show. The voders at the time were never quite able to capture the smugness of the voice actor, but I heard some fans created vocal patches that do a pretty good job of it." For additional reading about warbots, check out Classic Traveller Alien Module 4-Zhodani and Book 8 - Robots. Some of you might recognize this ship from my earlier posted images of a fighter hangar. Well here she is again. 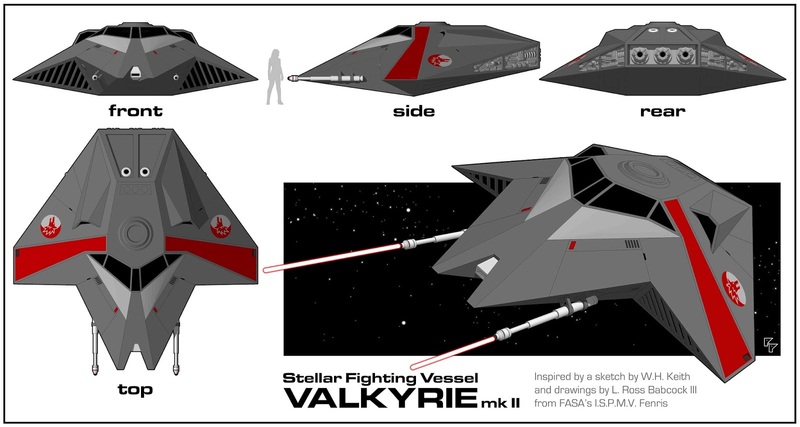 It was inspired by the Valkyrie fighter from FASA's I.S.P.M.V. Fenris. I liked the overall shape of the fighter, but after 36 years felt it was time for a facelift. Note: The Ularu (pronounced oo'-lar-oo) are a race I started creating in 1987 but never really fleshed out. I've taken them out recently and dusted them off for my Hu'kura campaign. The Ularu are a minor race of arthropodal sophonts native to the planet Hu'kura in the Foreven Subsector. The Ularu are descended from insectoid omnivore hunter stock. Ularu have thirty limbs. The forward-most six limbs may be considered proper arms ending with hands containing three opposable digits, and can be used for fine manipulation work. The remaining limbs are more leg-like and end in a pad-like foot. When running at top speed, an Ularu will lower its entire body to the ground and use its six arms as extra legs. They have a segmented body with a hard dorsal carapace. They are typically physically stronger and have more endurance than humans. They are slower than humans over short runs, but with their greater endurance, need less rest when traveling. While just as intelligent as humans, they do not have the same drive or curiosity. They are omnivorous, but prefer meat. They are ectothermic and typically regulate their body temperature by changing their environment. In times of great thermal distress, a gland in their body will release a chemical into the blood stream which will stabilize their body temperature. This benefit will keep the Ularu alive for an additional hour or two. The gland takes about a week to fully replenish itself. Typical adults range from 12 to 15 feet length, with about half of their body in the upright position, giving them a variable height, but usually in the 6 to 7 foot range. Adults usually weight between 180 and 240 kgs. They have large multi-faceted eyes giving them a visual field of about 270 degrees. 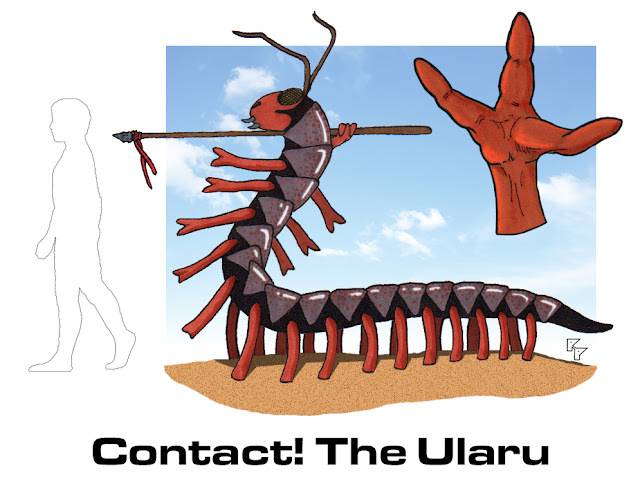 Their short range vision is comparable to humans, but Ularu have poor long distance eyesight. They have two olefactory antennae atop their head which gives them an excellent sense of smell. The base of the antennae contains a small tympanal organ giving them hearing comparable to humans. A key element of the Ularu psyche is the need for routine and the ability to stay focused on a task. Each Ularu has a job to do and they do it. It is possible that this is a throwback to an ancestral caste system or hive mind, but it has never been studied. The ability to stay focused makes the average Ularu a great worker, and the Ularans have built many great stone buildings, roads, aqueducts and other structures. However, this single-mindedness also prevents them from being creative. They are achievers, not innovators or problem solvers. Change occurs very slowly within Ularu society. Ularu are not mindless drones, however. They still have individual thoughts and desires, but these come second to the needs of their society. Ularu have two sexes. Pair bonding is pheromone based and couples mate for life. A typical female will only be impregnated once or twice in her life. After impregnation, the female grows within her an egg sac containing 2 to 4 fertilized eggs. After about six months of gestation the female expels her egg sac in a communal birthing nest, where the eggs are looked after by others until they hatch, usually within another two weeks. Ularu young can walk and eat solid food from birth. The birth parents have very little to do with raising of their young. Child rearing and education are left to a caregiver class until the young reach maturity around the age of ten. Ularu young will most often adopt the class of their birth parents and spend a two year period of instruction specific to that class. They are considered adult at the age of 12. Typical life expectancy is around 52 years. Very little is known about ancient Ularu history. About the time the ancient Ularu were developing written language, they were enslaved by an off-world race called the Vorga. It is unknown how long the Vorga kept the Ularu as slaves, possibly thousands of years. Approximately 3,000 years ago the Ularu rose up against the Vorga and defeated them and claimed independence. The Vorgan Downfall (as it came to be called) created a leadership vacuum and lead to the Ularan Civil War, the re-emergence of Ramu worship, and the rise of a religious dictatorship. Once the dust settled, the Ularu embarked on what they considered their “Divine Right of Conquest”. Called the Kakrha' Nin, it is a kind of religious mission of conquest and expansion, a cross between a holy war and Manifest Destiny. It is unclear exactly when humans arrived on Hu'kura, although it is believed they were there at the time of the Vorgan Downfall, but they were the first victims of the Kakrha' Nin. The humans that were not killed or captured fled to other parts of the continent and an intermittent war between the humans and the Ularu has been going on ever since. Politically and economically, Ularan society is socialist, bordering on communist, but its government is a religious dictatorship. Worship of their god, Ramu, and following ancient scriptures are a part of everyday life and rarely questioned. There is very little private ownership of property and all is given to the temple, which redistributes the wealth. A common prayer/response heard at the time of giving is "Ul huha ramuga, ka rumuga huha Ularu." (Give all to the temple, as the temple gives all to the people). While not strictly a caste system, Ularan society is divided among six major classes; Priests, Builders, Caregivers, Warriors, Feeders, and Crafters. Builders work on large scale construction projects, roads, etc. Caregivers are the doctors, educators, and raise the young. Warriors are the police, military and scouts. Feeders grow crops, raise food animals, and prepare food. Crafters manufacture tools, weapons, and small day to day items. While the typical Ularu will stay with his class for life, it is not unusual for some cross pollination between classes. For example, a priest may work within the warrior class to provide leadership and organization, builders may work with feeders to develop irrigation systems. Ularu are generally resistant to change and not very curious. They are at TL1 with some minor advances into TL2, especially in the area of metal smithing and weapon making. About 1 in every 2,000 Ularu are born with a mental aberration that does not become apparent until late adolescence. The symptoms of this aberration range from mild attention deficit disorder to full blown mania. Very little is known about the condition and ancient Ularu were known to kill their young exhibiting overtly strange behavior. Nanwi'min literally translates to "far dreamer", but does not have a direct Galanglic translation. The term suggests an Ularu who does not have focused thought, one who has their head in the clouds, or is easily distracted. As the ancient Ularu evolved a sense of morality and empathy, they eventually stopped killing the Nanwi. Over the past several centuries, the Ularu have started to recognize that Nanwi may be providing some societal benefits. GM notes: In reality, the aberration is really a sense of curiosity and the ability to think outside the box. In some cases it is also indicative of genius intelligence. A secret known only by the highest echelon priests is that all of the major advances in Ularu society have been brought about by Nanwi Ularu with the right combination of leadership, charisma, and social standing. It is these bold thinkers that keep the society from total stagnation. Ularu do not tend to use ranged weapons because of their poor distance vision. They instead prefer close combat and melee weapons, in particular spears, axes, hammers, and swords. Because of the Ularu's superior strength and extra arms, Ularu weapons are often larger than human weapons. An experienced Ularu warrior wielding a six-handed broadsword in close combat is a fearsome thing to see. Humans handling large Ularu weapons do so with a -2 DM. Ularu are naturally well armored. Treat their carapace as ballistic cloth armor and the rest of their body as jack leather. Ularu are very difficult to sneak up on. The combination of their wide angled vision and superior sense of smell is formidable in this matter. The most successful human attacks on Ularu have been made with ranged weapons while being downwind from the Ularu. The single-minded nature of the Ularu is antithetical to creative role playing. Everyone pretty much just follows orders given from their superiors. Unless you are role-playing the High Priest / Dictator it probably wouldn't be that much fun. Ularu have no nobles, so SOC is really more a measure of how one is respected within society, or their level of authority within their class. Ularu with high SOC are usually given the best of everything available. Feeder Class Skills: agriculture, animal handling, etc. Crafter Class Skills: metalworking, wood working, textiles, etc. The referee should determine skills based on a character's class and the number of terms served. To reflect a fairly stagnant society, skill levels should generally not exceed 3, and the total number of skill levels should not exceed the number of terms served. The Hu'Kura system is currently interdicted by the Third Imperium, although it is not part of the Imperium (there is a reason for that, but that's one of the mysteries the PCs must solve). The typical Ularu would not much care for leaving their home anyway. If Ularu ever do make it to the stars, it will be by some adventure seeking Nanwi. As an Ularu ages, their carapace will become thinner and less shiny. In an effort to maintain the status quo, aging Ularu will wax their carapace, sometimes to ridiculous levels of shine. This is considered a vain fad of the wealthy by the young and those of much lower social standing. It is particularly prevalent among the priest class. The Ularu keep a group of captive humans in every one of their towns and cities, regardless of size. The reason for keeping the humans captive is unclear, as they are not forced to do anything. The humans are kept and cared for (not very well, usually, but kept alive anyway). Some people have speculated that the humans are kept as pets or possibly as a kind of zoo exhibit, but there is not enough information to go on. If the need arises, Ularu can handle human TL1 and TL2 tools and melee weapons without a penalty. More sophisticated weapons or delicate equipment is operated at -2. Ularu cannot swim and they have a fear of deep water. They have no wet navy. Because they are ectothermic they become very sluggish in cold weather. Much of their religiously motivated expansion has been deterred by their own limitations. In Part 1, I showed you an overview of my gaming spreadsheet and went into some detail of the NPC generator and planetary system generator/details. This time I'll focus on the Weather/Event, Animal Encounters/Bestiary, and Reconfigurable List Of Many Things portions of the spreadsheet. Weather is something I often overlook in gaming. This is a simple temperature and weather generator based on the terrain type, level of development, latitude, season, and atmosphere. It is not very sophisticated, but each portion adds modifiers which affect the outcome. The output is daily high and low temperatures and sky conditions. Each terrain type also includes four randomized custom events. Terrain events follow the rules per Supplement 2 - Animal Encounters, so an event occurs on a roll of 10 on 2d6. If no terrain event occurs, an optional non-terrain event is picked at random from a growing list - currently about thirty. All events have a description and a brief note on how it affects game play. The Animal Encounters basically duplicates information found in Supplement 2. It checks for encounters twice per day (daytime and nighttime) and determines surprise and initiative. If the animal has surprise it lists what the animals first action would be. The initiative roll is not terribly sophisticated as it does not take into account things like PC party size, PC party vehicle, general PC noise level, animal camouflage or stealth, etc. The spreadsheet generates an animal whether or not there is an encounter. Animal stats are generated per Supplement 2 and generation is tied to the terrain chosen in the weather generator. A random animal description is provided and includes any special abilities the animal may have, what value if any the animal may have, and rumors about the animal. The arms and legs portion needs to be re-written, as I am almost always disappointed with the results. Finally, the table generates two real world animals to be used as additional inspiration. Probably the biggest workhorse of the entire spreadsheet, this list started out as the List of Many Things, and got it's name from the famous D&D magic item, the Deck of Many Things. I needed a place to generate short, simple answers to short simple questions. 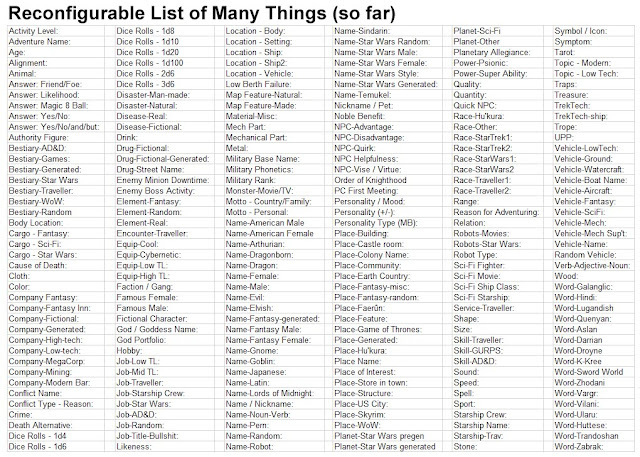 It initially started out as a static list of about a dozen items; character names, place names, random words, dice rolls, etc. Over time the list just grew and grew. Pretty soon the list was limited to the height of my monitor display and I had to convert the list from static to a pull-down menu style interface. This actually worked out well because now the desired information can be grouped together based on most frequently needed information. 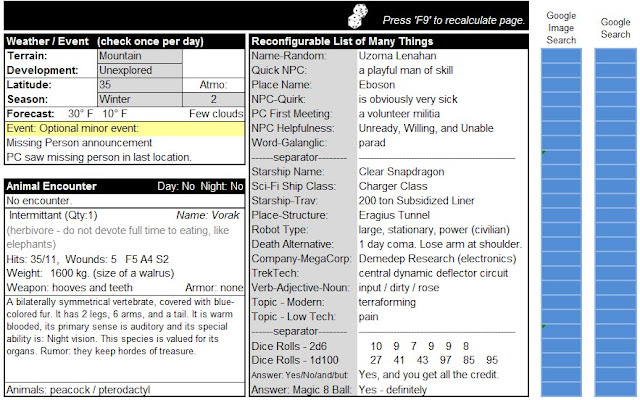 For example, when solo gaming I need a lot of 2d6 and percentage dice rolls, as well as random answers to Yes/No type questions, so I keep the bottom portion of the list dedicated to those types of answers. For those of you who are gluttons for punishment, I've included a list of all the items in the list, which has now grown to over 240 items (see image below). There are two columns of blue buttons to the right of the list, for doing Google image and information searches. I've found this to be extremely useful. There's really nothing special about this part of the spreadsheet. It is mostly just a bunch of text lists and simple random generators. Much of the information was derived from information or ideas found on random generators all over the web. 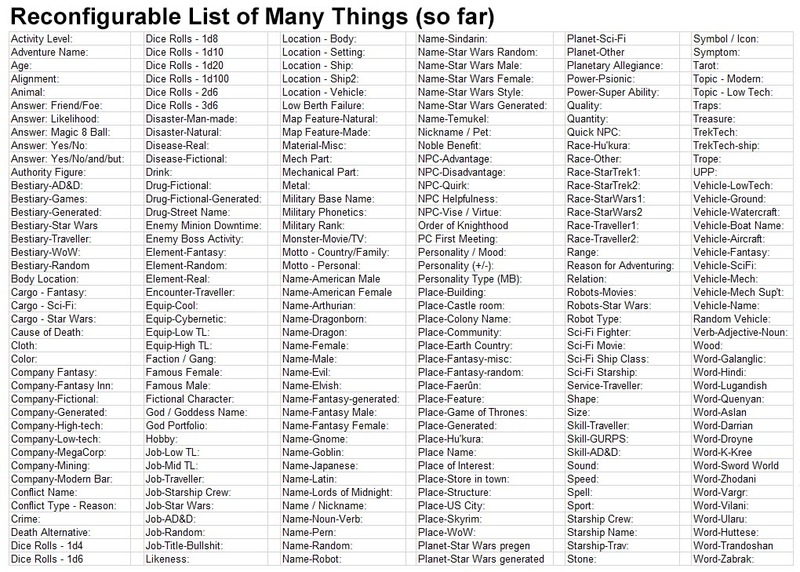 What I like about my version is that 1) I can customize it, 2) I don't have to keep track of dozens of websites, 3) I don't need to be online, 4) I can continually add to it, and 5) everything is in one location. Check these out if you haven't already. I've been asked by several people if I would be willing to share this spreadsheet. I would really love to as I find it a great resource. Unfortunately, when I started this I never thought it as something others might be interested in. As a result, over the eight or so years I've been putting this together I have been including a lot of copyrighted material, ideas for which the original creators should get credit, and in generally just kept adding to it without any kind of goal in mind. The spreadsheet's "home page" is as cleaned up as I can manage, but the behind the scenes data is a mess. Hopefully someday I will have time to either delete or rewrite the copyright material and clean it up enough to feel comfortable with sharing it. System Defense Boats can serve a wide variety of functions. This one has been outfitted to carry a squad of troops for customs inspections and boarding actions. The classic Traveller books do a pretty good job of describing the System Defense Boat, so I'm not going to write too much about them here. Check out Supplement 7 - Traders and Gunboats and JTAS #9 for more information. I've got plans to design a jump shuttle for it, but that will have to wait until later. For a higher resolution PDF, click this link: (Traveller Stardrake System Defense Boat deck plan). The deckplan was created to be printed out on 30"x42". Scale is 1" = 5'-0" so it can be used with 25mm miniatures. Enjoy! "Some nights I wake up and can still hear their screams." - Marden Garroway, Assistant Purser aboard the Tukera Lines passenger liner Lady of Regina, regarding the BuffBot 2000 incident of 1106. The BuffBot 3000 series is the latest in a long line of successful robots created by Ikeda Robotics. Smaller than it's infamous predecessor, the new model features all the same ship-cleaning features at a markedly lower price. In an attempt to win back the market share from its larger competitor, Ling Standard Products, Ikeda is practically giving away their new janitorial model and even Tukera is considering placing them on their liners again. Ikeda Robotics' one black mark is, of course, the Lady of Regina incident, which claimed the lives of seven passengers including Sir Ellis Tenhuff of Inthe and noted theoretical jump physicist Serina Drexler of Regina. Investigators were never able to determine the cause of the Buffbot's malfunction, but Ikeda executives maintain the robot had been tampered with. The more creative and less journalistically rigorous members of the press insisted that the whole event was to cover the assassination of the young noble Tenhuff, while others believed it had to do with Drexler's ground-breaking work on Project LongJump. Both Ikeda Robotics and Tukera Lines were cleared of all accusations of negligence due to lack of evidence. "Ship like this, be with you 'til the day you die." The Millennium Falcon looks like a piece of junk, the Heart of Gold has a computer with Genuine People Personalities, the Enterprise D's bridge looks like a lounge. The best starships in classic science fiction are characters themselves and can have just as much personality as any of the crew. Here's a list of quirks and perks you can add to your starships. Some will be positive, others negative. Some just add a little flavor. Some may have serious gameplay consequences. Some may act as adventure hooks. I mostly use these for random or NPC starships, and usually pick 2 or 3 for each ship. If the quirk is on the PCs ship, the players should be allowed to repair or replace the affected system if they wish. engine room is very hot. Costly to fix. 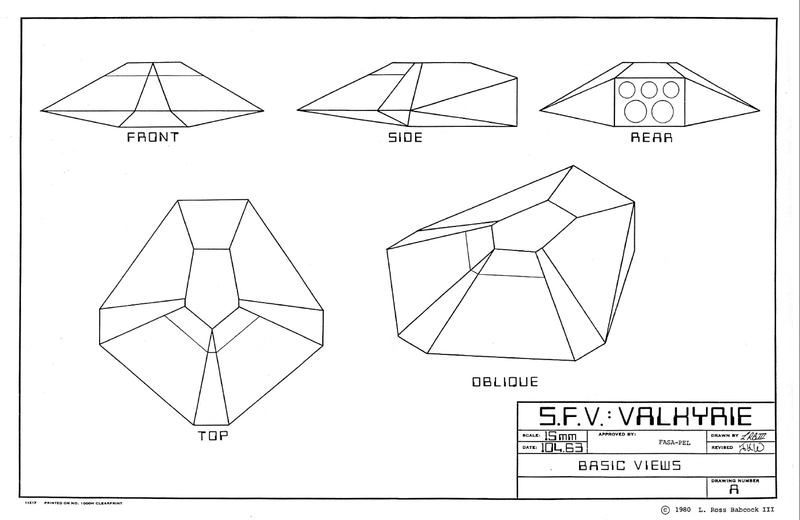 Personal Re-entry Pods go by many names: jump capsules, drop capsules, drop pods, escape pods, Human Entry Vehicles (HEV) or HEV Pods, Orbital Insertion Pods, or for those of you not into the whole brevity thing; Single Occupant Exo-atmospheric Insertion Vehicles (SOIEV). Regardless of what they are called, they are all designed to do pretty much the same thing; get a single passenger from a ship in orbit safely to the ground. I first remember reading about jump capsules in Robert A. Heinlein's Starship Troopers. The beginning of the book starts with a description of the "cap" (capsule) troopers making a drop from their ship to the planet below. Exciting stuff, and I was disappointed when the film version was made and it didn't include the capsule. 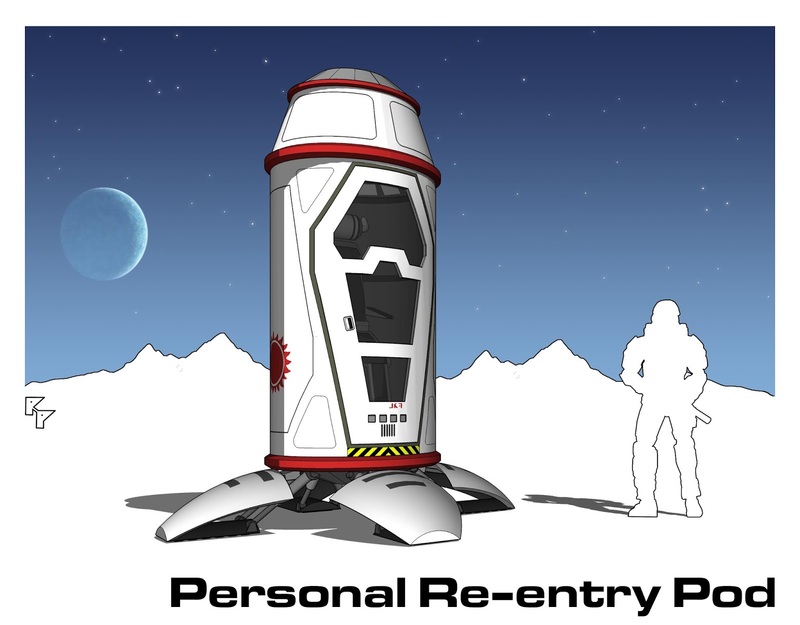 The basic personal re-entry pod requires no skill to operate. Flights and landing coordinates are pre-programmed allowing the passenger to just enter the pod and activate a single, clearly marked button to launch. Historically, drop pods have a relatively high casualty rate, but improvements are always being made. The pods shown include stabilizer fins to reduce atmospheric turbulence are coated with a ablative ceramic coating to reduce heat. A small grav unit used to achieve a relatively soft landing and makes the pod usable in any atmosphere or any size world. Pods are reusable, but are unable to reach orbit on their own. The must be retrieved and re-outfitted to be used again. In the military, drop pods are used primarily for the insertion of ground combat troops. Drop pods can provide a benefit in combat operations by presenting multiple small targets as opposed to one big one, and also by strategically placing troops in specific locations. Flights are pre-programmed in at a console in the drop bay, and the actual launch is initiated by an officer who remains on the ship. The typical one man pod is a tight fit for a soldier with gear, and special interiors have been created for those wearing battledress. The military also use a non-occupied version of the drop pod, which replaces the passenger compartment with a storage compartment for pinpoint delivery of weapons, food, and supplies. A drop pod's primary non-military use is as a spaceship's emergency escape vehicle. Escape vehicles designed for 8, 12, or 16 passengers are more the norm, and much more economical. Still, if you have a small ship, or when you want to get off a ship fast and don't want to wait for other passengers, the single occupant pod is the way to go. The pod's launch sequence is tied directly into the ship's navigation computer, which automatically computes the safest trajectory and landing zone. This information is updated automatically by the ship's computer every five minutes, although the pilot or navigator can select different coordinates if desired. Non-military models typically contain an emergency vacc suit, emergency rations and supplies, and an automated tracking beacon. 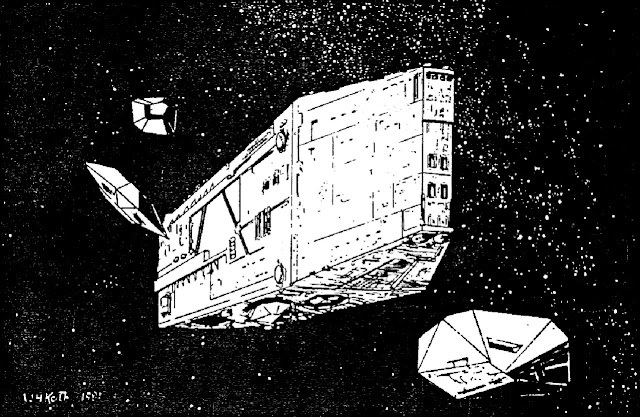 Check out Twilight of the GM's excellent article "Abandon Ship", for more thoughts about escape pods. Also take a look at Atomic Rockets well thought article on the folly of escape pods in the article "Emergency Deck". Below is a Drop Capsule geomorph, with a similar Pod Bay. It includes areas for the cap troops and a control center, from where the capsules are programmed and launched. In this scenario, even the sleeping quarters are pods - kind of like the Japanese capsule hotels. Maybe cap troopers are agoraphobes. If you are like me, you have, or at least had, notebooks and binders filled with your Traveller stuff: adventure ideas, NPCs, session notes, sketches, maps, deck plans. If you were organized, you had a different binder for each section. It's not a bad system, but hey - this is the future. Let's use technology to help keep us organized. My first attempt at creating a consolidated location for my gaming information was using Microsoft Word. I already owned it and knew how to use it. I could easily add graphics, and knew you could create text links to other parts of the document. I played with it for a couple of weeks, and while it did everything I needed it to it was just sort of clumsy, clearly not a tool created for the purpose I needed. I decided my next attempt should be to use actual wiki software and found TiddlyWiki. It was a kind of generic, multi-purpose wiki and had a lot of features that I liked. It was free, relatively easy to learn, had good linking abilities. Originally I really liked it, but I'm big into using imagery as part of story telling. TiddlyWiki couldn't, or I wouldn't learn how to, import graphics. So I searched for something better. I didn't have to look far to find Obsidian Portal. I found this to be much more of what I was looking for and it was designed specifically with gamers in mind. 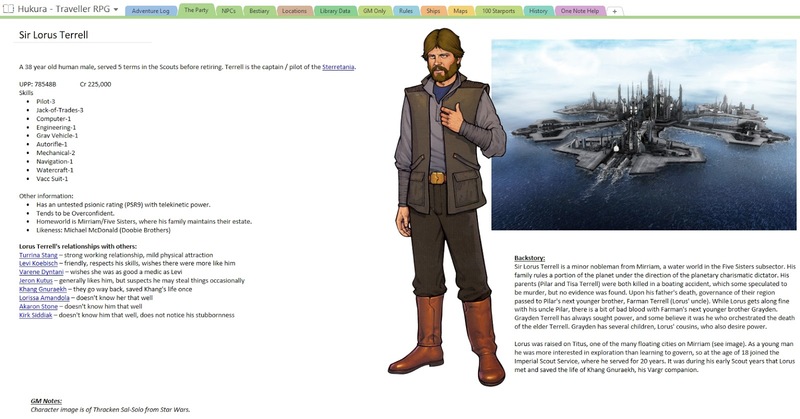 I transported all my TiddlyWiki entries over to Obsidian. I really liked that it would easily import graphics and did everything else a decent wiki should. Additionally, your campaign information was right there with hundreds or thousands others - a great source for inspiration and feedback. I eventually left Obsidian Portal, however. While they had a free version, I think there more features in a pay version (I could be wrong about this). The bigger issue for me at the time was that I traveled a great deal and did not always have a dependable internet connection. Since I mostly do solo-gaming, I didn't need a web-based wiki. I decided to look for something that would work on my desktop and laptop. I abandoned Obsidian Portal in 2009. I just checked and my Traveller campaign information is still there. Check it out if you are curious. I had heard good things from the gaming community about Evernote, Apple's note taking program. Being a PC boy myself, I checked and saw that I had Microsoft's OneNote already installed on my computer, but had never taken the time to learn anything about it. After plunking with it for a couple of hours I realized it had everything I needed, so I transported the data again from Obsidian Portal and put it in OneNote. I've been adding to it ever since. Writing text is as easy as any word processor and creating a link in text automatically creates a new page for that item. It includes an extremely easy screen clipping tool for capturing online images. I use it to link to favorite websites, and directories on my hard drive. There is no real page size, like in a standard notebook, which is a feature I have mixed feelings about. While you basically have unlimited space to write and add pictures, doing so is not conducive to easily printing on a standard paper size. This is not a huge issue for me, since I do very little printing, but an inconvenience when I want to. This is not meant to be a review of anything. I didn't do any research or anything to see what might be the best new software to address these needs. I imagine after seven years that Obsidian Portal just got better and that there are more options to choose from. Johnn Four, who runs one of my favorite gaming sites, Role Playing Tips, went live with Campaign Logger not too long ago. It looks like it might be promising. I'd be interested in hearing what other people are using to track their Traveller games with. I've added some images of my OneNote Traveller campaign (splash page/adventure summary, PC, NPC, bestiary, and equipment) so you can get a feel for how I use it. Enjoy!